One joy of my recent visit to Penn (see below) was a chance to look at recent work by Val Tannen and others on a generalized model of provenance. Reading these papers was the perfect way to brighten up my trip home. Truly elegant. Todd J. Green, Grigoris Karvounarakis, Val Tannen. Provenance semirings. PODS 2007, Beijing, China. J. Nathan Foster, Todd J. Green, Val Tannen. Annotated XML: queries and provenance. PODS 2008, Vancover, Canada. Last week, I enjoyed a visit to Penn for Nate Foster's PhD proposal. They have a great language group, and I had many enjoyable discussions. Many thanks to Nate Foster, Steve Zdanceowic, Benjamin Pierce, and everyone else for hosting my visit. I also got to read some great papers I might otherwise have missed. Here's one, another in my next post. Peng Li and Steve Zdancewic. Combining Events And Threads For Scalable Network Services. In Proc. 2007 ACM SIGPLAN Conference on Programming Languages Design and Implementation (PLDI), pages 189-199, 2007. 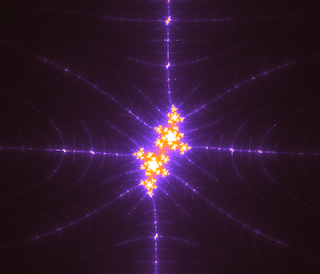 My MSc student, Iain Parris, has put together a brilliant web-based app for viewing Mandelbrot and Julia curves in real time. 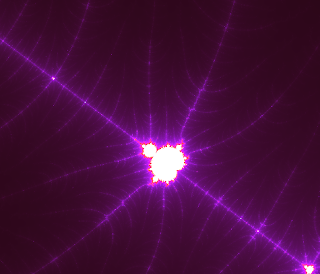 It lets you move about a point on the Mandelbrot set, and displays the corresponding Julia curve in real-time. There are other apps that perform similarly, but this is the only one I've seen that provides real-time response. Try it out! Functional programmers are always keen to gather evidence that it is actually of use in the 'real world'. Jane Street Capital, by adopting O'Caml as the language in which they write the programs that earn them so much money, has provided one of the clearest demonstations. Yaron Minsky delivered a brilliant invited talk to this effect at POPL 2008, and I'm delighted to see that he and Steven Weeks have now published a companion article for JFP. An error in a financial program of this kind can wipe out a firm's profits for the year in a few seconds, so reliability is a concern. The partners of Jane Street review the code themselves, and this turned out to be one of the major factors influencing the adoption of Caml. I thought their comments on OO programming were of interest. applications) rather than dynamic properties (what class an object is). I've had similar thoughts about the perils of inheritance, but this is one of the few places I've seen them documented.